Floss first, then brush or brush first, then floss? So which should I do first – I’ve heard arguments from knowledgeable people for both sides. So what’s the answer? The main argument for “brush first, then floss” is that flossing gets out the bigger bits of food and the bugs that are in and around the gums – then you can brush all the bits away with the toothbrush and toothpaste. That being said personally I’m a fan of “brush first, then floss”. With your toothbrush you are cleaning away the majority of the plaque and applying fluoride on the teeth which will strengthen them up – minimising the chance of cavities. However no matter how amazing your brushing technique is you’ll never be able to clean in between the teeth and thats why flossing or using your interdental Tepe brushes is so important. Also its always a lot nicer to floss when the teeth have just been brushed. So when is the best time to floss? 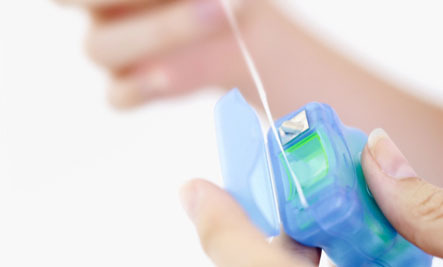 Its probably best to floss last thing before sleeping – that way your mouth is fully bug-free overnight. So there you have it… you can try it out for yourselves to see which you prefer. At the end of the day as long as you are flossing whether its before or of after the brush I don’t mind. The important thing is that you are actually flossing!